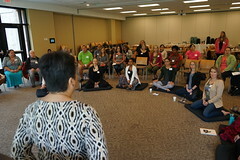 On June 16, 40 participants attended Indigenous Mindfulness: A Day of Practice and Community Building, led by Dr. Bonnie Duran from the University of Washington in Seattle and Dr. Kyra Bobinet, CEO of engagedIN in California. Joining us were Catalyst Advisory Cabinet Members, community partners and an emergent network of people eager to build their self-care and healing practices. The day was a combination of lecture, conversation and experiential practice in mindfulness meditation led by two Indigenous leaders from the West Coast. Participants had the opportunity to learn more about what mindfulness meditation is and practiced guided sitting meditation with Dr. Duran. Dr. Bobinet shared information on the brain science of meditation and how calming the mind enhances overall health. One participant even said that this "event changed my life." Interested in learning more about mindfulness meditation and how it works? Take a look at our website for the resources that Dr. Duran provided during this event. We are excited to announce that our event Building Resilience: Restoring our Human Capacity to Heal is now open for registration. Building Resilience will explore the potential impact of using culturally relevant healing practices to recover from primary, secondary, historic and other types of trauma. This event will be of interest to community members, funders, policy leaders, health care professionals and anyone working in or experiencing stressful situations on a regular basis. Experiential breakout sessions and dynamic speakers will share how we can move from merely surviving to thriving. Results of a preliminary literature review will be available as well. Space is limited so register early. For more information please go to our website. 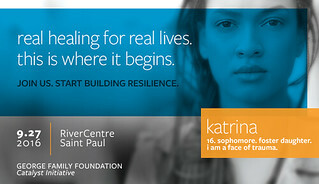 Don't forget to use the hashtag #buildingresilience. Adagio Holistic and Centro Tyrone Guzman, Catalyst community partners, will be hosting a community health fair at Centro on September 24, 2016. This event is open to all and will be a great opportunity for community members to come together to learn more about how one can care for oneself using integrative healing techniques as well as traditional cultural practices. Rita Navarrete Perez and Tonita Gonzales, internationally renowned Traditional Healers/Curanderas from Mexico and New Mexico, will share skills and techniques to educate us in traditional healing, or curanderismo. Their goal is to empower others to become their own healers by listening to their own bodies. More information about this event, including date and location, will be available online. 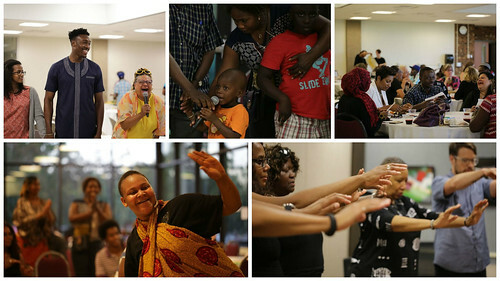 On Tuedsay July 12, 2016, nearly 150 people came together with Catalyst community allies Marnita's Table and Multicultural Kids Network to feast, connect and explore the power of traditional healing practices in the African diaspora. The event opened with a moment of silence to honor victims of recent violence in Minnesota and elsewhere. The evening featured energy healing, mind/body breath work, and an onsite quiet space. Community resources were shared, and we closed with a powerful Bantu Healing Drum circle led by Multicultural Kids Network. "I felt human connections and feel whole in mind, body and soul." "My heart is full and I feel healed from the session with the beautiful energy healer." "I feel connected. I feel like my heart is open and barriers are down. This has opened my eyes to the beauty of other humans and how we are all connected. Thank you." "Now, more than ever, it is vital for us to come together and celebrate our common humanity." During an evening characterized by laughter and community celebration, people had the opportunity to meet someone new, participate in a healing drum circle and dance, as well as share their thoughts on how to improve well-being in their community. As the Catalyst Initiative reaches the halfway point in its three year lifetime we decided to pause and take a look back at the work that has been accomplished, as well as the relationships and projects that have been nurtured and developed. Learn about the exciting work emerging and opportunities to grow in the future by reading the Mid-Initiative Report. The Catalyst Initiative of the George Family Foundation is an integrative health initiative designed to help communities realize their capacity to support health and wellbeing using mind-body approaches that are culturally meaningful. Learn more about Catalyst.